Grill spuds and garlic on skewers to make this vegetarian potato salad. 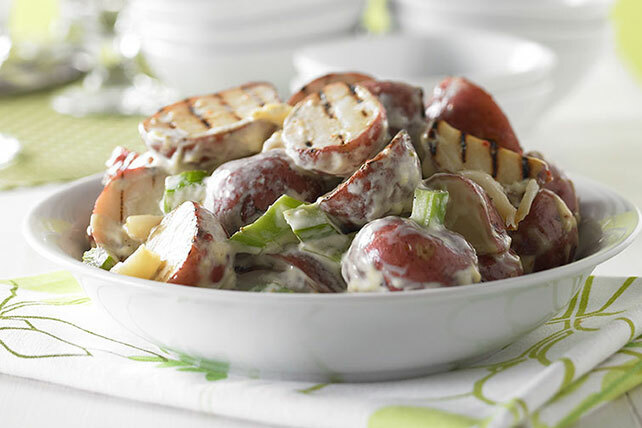 This Grilled Vegetarian Potato Salad is the perfect addition to the barbecue. Place potatoes and water in 2-qt. microwaveable casserole; cover with lid. Microwave on HIGH 8 min., rotating dish after 4 min. Meanwhile, cut thin slice off top of each garlic clove, leaving papery skin on cloves; discard tops. (Do not cut root ends.) Place garlic on sheet of foil; drizzle with 1 Tbsp. dressing. Wrap garlic in foil. Drain potatoes; thread onto skewers. Brush with some of the remaining dressing. Grill potatoes and garlic 10 to 15 min. or until potatoes are tender, turning potatoes frequently and brushing with remaining dressing. Remove potatoes and garlic from grill; cool. Remove garlic pulp from skins. (See Tip.) Mix garlic with mayo and mustard in large bowl. Add potatoes and celery to mustard mixture; mix lightly. Refrigerate several hours or until chilled. Squeeze each garlic clove from the root end to remove the roasted cloves from the papery skins. Prepare with MIRACLE WHIP Dressing for the mayo. Increase the number of roasted garlic cloves used in the potato salad. For the real garlic lover, use the pulp from the entire roasted bulb. Just cut the top from the entire bulb, leaving all cloves together. Drizzle with dressing and grill as directed. Squeeze the amount of garlic pulp desired for the potato salad. Refrigerate remaining garlic for another use. For an extra flavor boost, substitute GREY POUPON Dijon Mustard for the HEINZ Yellow Mustard.